I can hear the voice of detective and gourmand Homer Evans resounding in my head at this very moment. He possesses an upper class-sounding accent, with perfect phrasing and diction like that of George Plimpton, along with a touch of Dickens’ Mr. Pumblechook—pompous and imperious. By the conclusion of this book, however, readers might be begging for the verbose rancor of W.C. Fields just to lighten things up a bit. Foregoing nitpicking, a holistic view is needed to capture from this work what it offers to discerning and tenacious readers. The Black and the Red (1956) is the ninth mystery in Elliot Paul’s Homer Evans series and, like the other books, it’s a parody of epicurean sleuths in the Philo Vance and Nero Wolfe vein. While there is murder in this novel—two, actually—they are so inconsequential to the workings of the plot, and are given such little gravity, that they were probably tossed in merely so that the tale could be placed on the murder-mystery shelf. Homer Evans is a superman-type of person who believes that being faster than a speeding bullet means you’re the most quick-witted person in any room. This, Homer Evans certainly is. He’s invincible, all-knowing, and all-seeing (“trying to lie to Mr. Evans was more futile than reaching for the moon or diving to grasp its reflection”). As a detective, he is always so many steps ahead of criminals and reality, that he seems gifted with ESP. Evans has the foresight to bug a criminal’s hideout even before a crime takes place, and is a cool-headed overachiever from whom pilots ask advice on how to safely land disabled planes. He speaks as if he’d memorized a dictionary and, in addition, likes to show off his learning, lading his much-used periodic sentences (and you thought Edmund Wilson was the master of this) with more interjections (“I beg of you,” “God forbid,” etc.) than you can wave a stick at. The mystery in these pages is why an oilman and Las Vegas casino operator (can anyone say Howard Hughes?) has induced Jean Pierre Sabin, the renowned gastronome from Cannes, to quit the Riviera and work in Vegas during the gangster-rife 1950s. Everyone wants to know, and there are plenty of everyone packed into this book. Mobsters, Hollywood Strip bigwigs, Vegas operators, artists, mannequins, Evans’ pistol-packing assistant Miriam Leonard, private detectives, and the pilot fish they all attract race through the pages with the speed and tumult of the actors in It’s a Mad, Mad, Mad, Mad World. Gangsters talk like gangsters; cowboys talk like cowboys; and prudish epicures are as dimensional as the paper on which they were created. 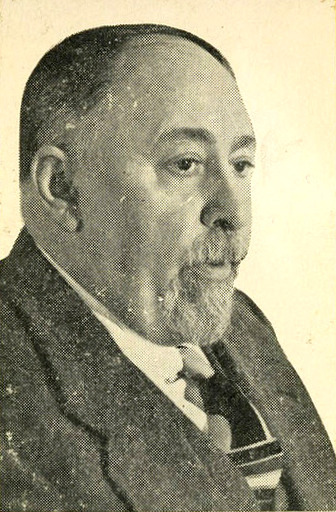 (Right) Elliot Paul; photo by Schell. Myriad subplots squeak round and round like rusty hamster wheels and Paul applies little grease; yet without them, this book would be lacking. As outlandish as the fictional situations are, everything fits, and here’s why: it’s the prose, not the story line, that serves as reason for picking this book up in the first place. The extravagant yet somehow confiding voice lulls readers into wishing they could hurl themselves straight into this yarn and stand at Evans’ side. The more the narrator and Evans reveal of facts, details, and honest, uncensored observations—no matter how purple and overstated they may be—the more it appears the narrator is revealing his true personality, sharing with the reader his innermost thoughts. One gets the sense of being on a great quest with a great man. When the omniscient narrator over-reaches, he nearly falls out of the book onto the floor, as when Sabin “sighed like a weary gnu between feeding times.” Not every square inch of a work of art needs adornment, and an all-knowing narrator should perhaps have possessed the wisdom to leave this tidbit to the expertise of Marlin Perkins. They sure don’t write ’em like this anymore. A fly in amber that at one point in time would’ve been called “clever,” this book’s appeal is the easy rapport it creates between a likeable know-it-all and a reader who might want a change from The New Yorker. It’s an artificial and perfect world (sans murder), wherein every mess of a jigsaw puzzle falls together at the snap of Evans’ fingers. Is this an example of good writing? Well, sure. But can it be bad writing as well? Well yes, inasmuch as it’s been written by an author who’s unrelentingly smitten with the sound of his own voice. The trick here is to take Nabokov’s observation, that satire is a lesson and parody is a game, turn off the critical thinking part of your brain, and enjoy the ride. 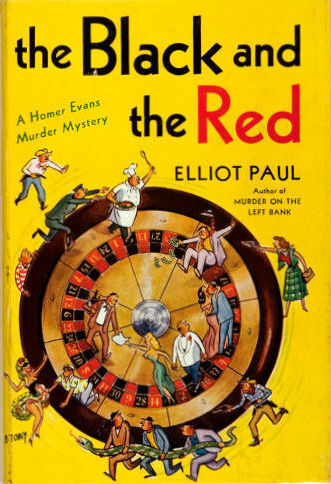 READ MORE: There’s a great deal more information about author Elliot Paul here; a Web site called The Lineup chose his 1939 novel, The Mysterious Mickey Finn, as one of “10 Forgotten Mystery Masterpieces”; and a blog called Interlude examines the use of musical references in the Homer Evans series.